Laquilalaquilalaquilaaliqualaliqualaliqual: a very simple game that consists of repeating a word again and again until its meaning breaks down and becomes something mysterious that disorientates us and gives us the opportunity to imagine a world that has suddenly become something else. Leaving behind the archipelago of the new suburbs built following the earthquake, Massimo Mastrorillo returns to the city centre, but this closing in draws him into a centrifugal dynamic: fragments and ruins seem to come to life in an improbable dystopian future that becomes the metaphor of a much further-reaching crisis, beyond the effects of an event – the earthquake – that is still far from being overcome. It is an existential and collective crisis that manifests itself in a rapport with history and memory that seems inexorably destined to lose its meaning in the relentless pursuit of interiors of a centre that seems infested rather than inhabited, where everything is subject to continuous metamorphoses, and the organic mingles with the disorganic. In this suspended time, it becomes impossible to explore the future with the language of documentation, which is replaced instead by almost automatic recordings of colours, lines and geometric patterns. They offer an improbable measurement of the chaos that attempts to rebuild new possibilities of existence through the continuous disassembly and reassembly of forms. Among his major projects: “Mozambique a Nation Balanced Between Poverty and Dream,”, “Indonesia: Just Another Day”, “White Murder”, “Bosnia and Herzegovina: if Chaos awakens the Madness”, “Life after Zero Hour” and “Aliqual”. His major awards include: the World Press Photo, the Pictures of the Year International (POYi) and the Best of Photojournalism (Magazine Photographer of the Year), FNAC “Attenzione Talento Fotografico”, the PDN Photo Annual, the International Photographer of the Year at the 5th Annual Lucie Awards, the Sony World Photography Awards, a nomination for the Prix Pictet 2009 “Earth”, the Aftermath Grant (finalist, 2011). 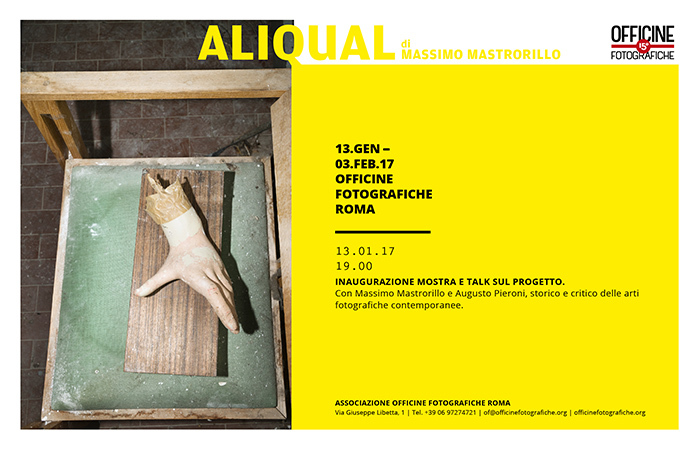 “Aliqual”, his body of work on the earthquake aftermath in L’Aquila, Italy, has been nominated for the Prix Pictet 2015 “Disorder”. Currently Mastrorillo is working on his next project “Il Mare siamo Noi”, a project about the assets seized or confiscated to mafia organizations in Italy, shortlisted for the Vevey Images Grant 2015. He was Talent Manager at LUZ, founder of the Luz Academy, Leica Ambassador. He has been teaching for several years at the Scuola Romana di Fotografia, the Leica Akademie and the DOOR Academy. Mastrorillo is a member and one of the founders of D.O.O.R. a Roman factory working with photography, visual art and publishing.